Sea ice extent averaged over the month of April 2009 was 14.58 million square kilometers (5.63 million square miles). This was 710,000 square kilometers (274,000 square miles) above the record low for April in 2007, and 420,000 square kilometers (162,000 square miles) below the 1979 to 2000 average. The decline rate for the month of April was the third slowest on record. The Arctic lost sea ice cover at a rate of 27,300 square kilometers per day (10,500 square miles), compared to an average of 41,600 square kilometers (16,000 square miles) per day for 1979 to 2000. Ice extent was well above normal in the Bering Sea, but below normal in the Barents Sea and the Sea of Okhotsk. For the past few years, Arctic sea ice extent for most months has been more than two standard deviations below the 1979 to 2000 mean, particularly in summer. Two standard deviations provide an estimate of the expected range of natural variability. Because of cooler than average temperatures, Arctic sea ice extent at the end of April 2009 was within the expected range of natural variability. Compared to previous Aprils, April 2009 is near the middle of the distribution (10th lowest of 31 years). The linear trend indicates that for the month of April, ice extent is declining by 2.8% per decade, an average of 42,400 square kilometers (16,400 square miles) of ice per year. Cool conditions over the Bering Sea, noted in the April 2009 update, persisted through mid-April. 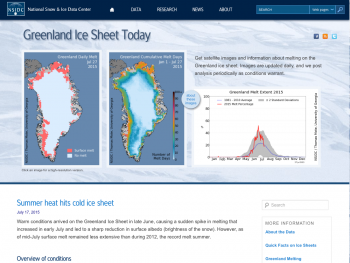 Cool weather also slowed ice loss in the Barents Sea. The cool temperatures resulted from the movement of cold air from eastern Siberia across the central Arctic. After mid-April, the pattern shifted to relatively warmer conditions in the Bering Sea and melt progressed, resulting in the faster decline in the total extent during the second half of the month. It is difficult to assess how the slow decline through April will affect the summer minimum ice extent. Persistence of cool conditions through the summer could lead to a greater September ice extent compared to that of recent years. However, as discussed in our last post, the spring ice cover is thin and hence quite vulnerable to summer melt. However this summer unfolds, scientists expect to see high year-to-year variability in ice extent embedded within the long-term decline. Can summer ice extent affect winter weather? A new study suggests that Arctic ice extent at the end of summer can affect precipitation at lower latitudes the following winter. Jennifer Francis from Rutgers University and colleagues compared winter weather following summers with below-average ice extent, to weather following summers with above-average ice. The researchers found that low summer sea ice extent is linked to drier winters over much of the U.S., Scandinavia, and Alaska, and wetter winters in the northern Mediterranean, Japan, and the Pacific Northwest. The study showed that extensive ice loss in summer warmed the Arctic atmosphere during autumn. This warmth weakened the storm track that encircles the northern hemisphere, affecting weather patterns far away from the Arctic. 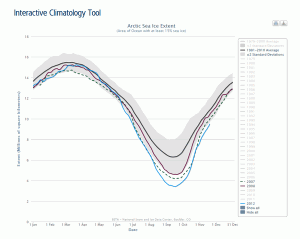 As sea ice continues to decline in summer, these influences will become more prominent. Francis, J. A., W. Chan, D. J. Leathers, J. R. Miller, and D. E. Veron. 2009. Winter Northern Hemisphere weather patterns remember summer Arctic sea-ice extent. Geophysical Research Letters, 36, L07503, doi:10.1029/2009GL037274.